My aim for January is to make all the cards for friends and family birthdays and anniversaries in advance. 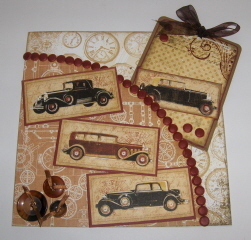 Here are the first two made with a vintage car theme. 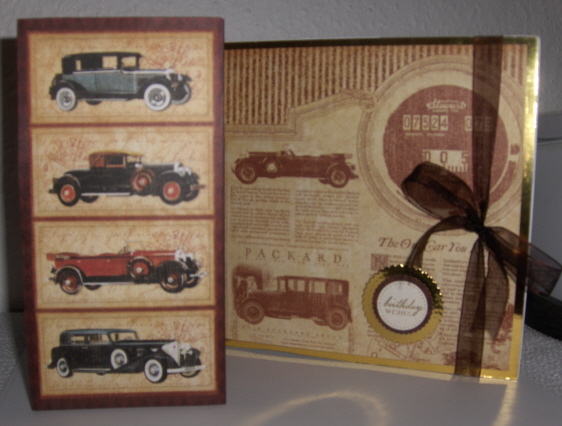 The papers used were from: Bo Bunny Timepeice collection, Kanban Metalica collection and a sheet of 12 x12 with vintage cars on it - so sorry can't remember the make. On the first one I made a pocket on the front of the card to house a tag which I also made. The pocket was then edged in Candi by Craftwork Cards. The second card was just a simple folded card which was covered using the reverse of the vintage cars paper matted onto gold mirror card on the inside, and four of the vintage cars on the outside.